Do you have products for redness caused by bad dermastamping/rolling/needling? Hi in October 2012 I had dermarolling done by a dermatologist over my whole face but with special concentration on 3 chickenpox scars on my cheek. There was no improvement but since the principle of dermarolling - unlike what I had read about lasers which had the downside of being ablative - was apparently one of 'can't lose, can only maybe win' - in that even if it may or may help my chicken pox pitted scars, the treatment would be a positive thing for my skin. So in May 2013, I had dermastamping done by another dermatologist who told me that dermastamping was the advanced form of rolling, as rolling tears the skin unduly as it comes from an angle, whereas dermastamping in it's straight up and down movement promotes the collagen reaction without causing the damage dermarolling does (is this true?). Additionally he used stem cell treatment on my face and also used a single needle on my 3 pock marks to 'break up the scar tissue'. Over one month later not only has there been no reduction in the chickenpox scars, but all 3 of them have patches of redness around them, which are not fading - was this caused by him doing needling which he shouldn't have? My questions are: 1. Is it correct that dermastamping is better than dermarolling, 2. is needling on deeper scars a bad thing in itself, or did him performing that procedure badly lead to this redness?, and 3. most importantly what products do you have that can get rid of these apparently permanent red / discoloured patches of skin / circles around my 3 scars? Please help! Thank you in advance. Re: Do you have products for redness caused by bad dermastamping/rolling/needling? First of all, you should go back to you doctor and he should help you with your hyperpigmentation. In general, no. Each alone or their combination has its role for specific cases. Dermastamping is more targeted and more intensive and is very effective for all types of scars and wrinkles. 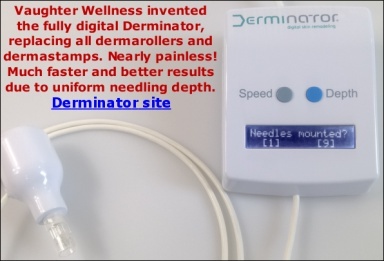 Dermarolling is more suitable for example for large areas of sun damaged, lost elasticity skin. The only reservations I have is using a 2 mm dermaroller on (thin) facial skin. Concerning the face, I basically only recommend this size for men with serious facial scars. No, it is not a bad approach at all. Needling indented scars, whether deep or shallow very often fills them up or partially fills them up. Unfortunately, in some rare cases, in individuals very prone to get hyperpigmentation, the skin reacts to needling by producing more pigment melanin (melanin is normally present in the skin). Individuals prone to hyperpigmentation can get hyperpigmentation even after very small skin "disruptions" for example a bug bite. 3. most importantly what products do you have that can get rid of these apparently permanent red / discoloured patches of skin / circles around my 3 scars? Please help! Thank you in advance. The only product that we sell which could help is Tretinoin.